Samsung M10 Offers: Samsung India has been launched all-new M series smartphones in India. M10 is one of the first device in M series which is paired with Infinity-V display at such a low cost. Samsung galaxy M10 offers great 90% screen to body ratio, 3GB RAM, 32GB ROM, 13MP + 5Mp Dual camera, 5MP front camera, 3400mah battery and more. . You can buy Samsung Galaxy M10 exclusively at Amazon.in. What is Samsung Galaxy M10 Launch Date? What is Samsung Galaxy M10 Price? What Experts has to Say About Samsung Galaxy M10? Samsung Galaxy M10 | M20 | M30 - LATEST NEWS!!! Samsung Galaxy M – Jio Double Data Offer – 2019” entitles you to Double Data to all Jio customers (existing and new) who will activate Samsung Galaxy M10 or Samsung Galaxy M20 on the Jio network for the first time on or after 5th February, 2019 and perform a recharge of Rs.198/- or Rs.299/- Jio prepaid plan on or after 5th February, 2019. After successful recharge of Rs.198/- or 299/- on an eligible device, double data voucher offering additional data equivalent to data entitlement as per the selected tariff plan will be credited in MyJio app. The subscriber can avail double data voucher upon performing a recharge of Rs.198/- or Rs.299/- for a maximum of 10 times before 30th June, 2020. Samsung has, of late, been a competitor to other prominent brands in India and with the introduction of a new ‘M’ lineup, it has decided to leap one notch ahead. One of the company’s first smartphones to sport a waterdrop notch or an Infinity V display, the Samsung Galaxy M10 offers a full screen display, a new Exynos processor, ultra wide cameras, and a long lasting battery with quick charging support. Samsung Galaxy M10 specifications include a 6.0-inch FHD+ display, a new 1.6GHz Octa-core Exynos 7870 chipset by Samsung, a 13MP single rear camera sensor, and a 5MP front facing camera for selfies. Along with the Exynos chipset, the Samsung Galaxy M10 offers an ARM Mali-T830 MP1 GPU for gaming and other graphics intensive tasks. The smartphone packs a 3,400 mAh long lasting battery that will last you a whole day on a single charge, 3GB of RAM with up to 32GB inbuilt storage that can be expanded by a microSD card using the dedicated memory expansion slot. 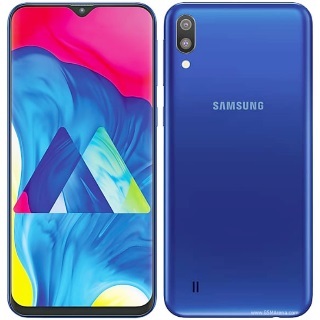 Here, you will get all the best possible Samsung Galaxy M10 discount and the Samsung Galaxy M10 launch offers on Amazon. Get total damage protection @ Rs 699 only. No Cost EMI upto 6 months. Jio galacy club offer where user can have saving worth Rs 3110 as Double data offer till 10 jio recharges. Get free Mobile cases and covers for your Samsung m series. Samsung Galaxy M10 launch date has been set for 28th January 2019 when the smartphone will be unveiled exclusively on Amazon.in with exclusive Samsung Galaxy M10 sale offers on the e-commerce portal. The smartphone is expected to go on sale for the first time starting 2nd February 2019. The smartphone will be an Amazon Exclusive and will be launched on 28th January 2019 in India. We expect the Samsung Galaxy M10 price to start at around Rs 9,999. The smartphone will be available in a Black colour and will pack 3GB of RAM along with 16GB or 32GB of inbuilt storage. You will be able to make use of many launch offers including the Samsung Galaxy M10 bank offers on Amazon.in such as no cost EMIs and more. As the smartphone will be an Amazon exclusive, there will be no available Samsung Galaxy M10 Flipkart offers for which you might be searching, but we will surely list all the best Samsung Galaxy M10 Amazon offers to bring down the price of the smartphone for you. How is the Samsung Galaxy M10 Design? It has a stunning Infinity V display and a metal body. Does Samsung Galaxy M10 case cover comes bundled in the box? Does Samsung Galaxy M10 has a microUSB charging port? Yes, there is a microUSB charging port on the Samsung Galaxy M10. Does Samsung Galaxy M10 has face unlock? Yes, Samsung Galaxy M10 features an AI Face Unlock feature. Is the Samsung Galaxy M10 Fingerprint sensor fast enough? Yes, the fingerprint sensor on the Samsung Galaxy M10 is pretty fast. How is the Samsung Galaxy M10 Display? Samsung Galaxy M10 features a 6.0-inch FHD+ Infinity V display. Does Samsung Galaxy M10 has a dedicated card slot? Yes, Samsung Galaxy M10 has a dedicated card slot. Does Samsung Galaxy M10 support Dual SIM Dual VoLTE? Yes, dual SIM VoLTE is supported on Samsung Galaxy M10. How is the Samsung Galaxy M10 battery backup? Samsung Galaxy M10 packs a 3,400 mAh battery that will last you almost a day on single charge. Does Samsung Galaxy M10 support fast charging? Yes, it comes with fast charging support.